The SUV team at Mercedes-Benz has been busy in 2015 with the arrival of the GLC, GLE and GLE Coupe. Certainly, you’d be forgiven for thinking that three SUVs is enough for one year, but Mercedes-Benz has one more model to tick off – the GLS. Has it saved the best for last? The GLS might sound unfamiliar, but it's actually the new name for the GL and the additional S denotes its new-found attachment to the S-Class family. This means it sits at the top of the Mercedes-Benz SUV range with prices starting at £69,100. As well as new badges, it also gets some minor updates over the outgoing GL, with new lights, bumpers and a more luxurious interior. Like its predecessor, the GLS is built in the USA and offered with two engines: a 3.0-litre V6 diesel and a performance focussed 5.5-litre V8 petrol. Both are almost identical to the engines used in the GL, although the diesel is more efficient thanks to a new nine-speed automatic gearbox. Unsurprisingly, the 350 d - will make up the vast majority of sales. The V6 is linked to 4MAtic four-wheel drive and offered in two trims - sporty AMG Line or luxurious designo Line. Both will tow a respectable 3.5 tonnes and return a claimed 37.2mpg, while emitting 199g/km of CO2 - which is only a slight improvement over the GL's 35.3mpg and 209g/km. As with any vehicle from the USA, the GLS is huge in stature, stretching more than five metres in length and around two metres in height. Mercedes-Benz doesn't hide the fact that the GLS is predominantly designed for the US and it shows with the big Merc dwarfing almost everything else on the road. All of that space is put to good use though, with the high roof line and two metre wide body providing acres of head and leg room across the first two rows of seats. Indeed, five adults will easily slip into the cavernous interior, while a third row of seats - located under the boot floor - transforms the GLS into a luxurious minibus for the school run. Getting in and out is easy too, with illuminated side running boards and large doors with wide openings. The second row tilts and folds forwards, which lets kids - large and small - climb into the surprisingly spacious third row. When not in use, the third row of seats can be electronically lowered the floor to provide 680 litres of flat boot space. Standard equipment is high across the range and even the entry AMG trim gets the choice of five types of leather for the seats and four different wood trims for the cabin. Air suspension is also standard, along with three-zone climate control, LED headlights and a 360° camera to aid parking. The centre stack is smart and dominated by a new eight-inch touchscreen that is easy to use for infotainment and navigation, thanks to its responsive nature and colourful display. On the road the GLS is easy to drive and extremely comfortable. The 3.0-litre diesel is refined and operates with a smooth hum, while road and wind noise is well supressed, which is impressive when you consider the GLS' huge size. All models run on 21-inch wheels, but the expected jarring and bumps in the ride are all but eliminated by the excellent air suspension. However, the GLS will pitch and roll into tight corners, although this can be remedied by the optional Active Curve system, with adjustable anti-roll bars. The considerable width and length of the GLS does make it tricky to navigate around town and almost all parking spaces feel like a squeeze, while even the largest multi-storey will require caution to avoid kerbing the alloy wheels or scuffing the bodywork. Likewise, tight A roads are a burden too, and an oncoming family hatchback will require slowing to a crawl to ensure the wing mirrors don't trade blows. The handling is competent for such a large SUV though, but never stretches beyond the mundane owing to the vague and overpowered nature of the steering. The GLS does get a Dynamic Select system, with six different driving modes, but few of them really improve the slow and cumbersome handling. 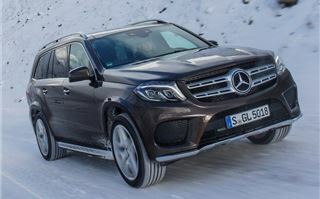 However, the GLS is a decent off-roader and will easily cope with snow, mud or flooded roads. An additional off-road pack can be added with low-range gearing and a differential, as well raising the ride height to 306mm, although few GLS drivers will ever venture further than a muddy field. 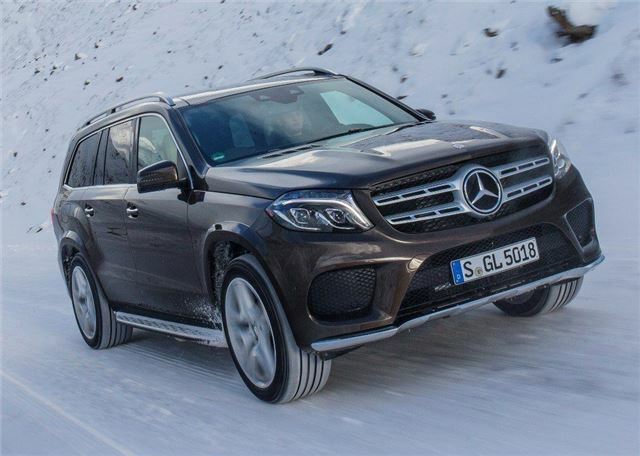 Despite its niche appeal and huge stature, the GLS is a very good luxurious seven seater. It's got lots of space and its stateside styling makes it stand out from the rest of the premium SUV crowd. Admittedly, it lacks the opulence of the Range Rover or the smartness of the Q7, but it still ranks as one of the most comfortable and capable large family SUVs around. It's just a pity it doesn't feel as rewarding behind the wheel. The Mercedes-Benz GLS is available to order now.